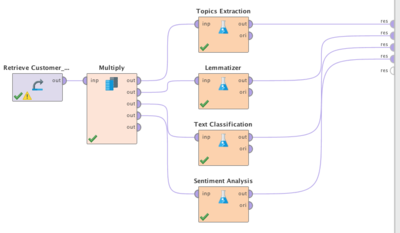 MeaningCloud, the leader in cloud-based semantic analytics, today announced its Extension for RapidMiner, which provides users of this analytical tool with a set of operators performing some of MeaningCloud’s most popular functions: entity and concept extraction, theme classification using standard taxonomies, sentiment analysis, and lemmatization. More importantly, MeaningCloud has incorporated powerful customization tools that enable users to adapt it to the application domain (e.g. analysis of the voice of the customer in the financial industry) through the creation of personal dictionaries and classification and sentiment models. These capabilities are unique in the industry and ensure high levels of recall and precision. RapidMiner is a leading-edge platform for predictive analytics that enables organizations to prepare data, create and validate models, and operationalize predictive analytics in any business process. Until now, users could not effectively incorporate unstructured text analytics into their models in such a way that they could customize information extraction or classification tasks and adapt them to their application domain to achieve maximum accuracy. With this extension, MeaningCloud gives RapidMiner users the ability to structure all types of text and extract its meaning. In this way, they can combine this information with structured data and incorporate both data sets into RapidMiner's powerful predictive models with practical applications ranging from root cause analysis in customer surveys to fraud or churn prevention. Learn more at MeaningCloud's blog. MeaningCloud's extension for RapidMiner, along with some practical usage examples, will be presented in a webinar that will take place on Thursday, April 27th at 9:00 am PDT. Register here. MeaningCloud is the easiest, most powerful, and most affordable way to extract the meaning of any kind of unstructured content, from social conversations to internal files. Use its plug-ins to easily perform text analytics in your spreadsheet, graphically customize its text classification and sentiment analysis functions to your specific domain to obtain unparalleled accuracy, and embed semantic analysis into your applications without risk through its pay-per-use web-based APIs.